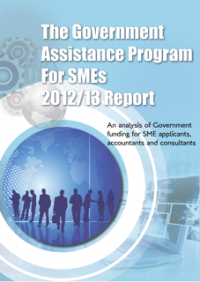 For many potential applicants, advisers and consultants wanting to understand the amount of Government funding that is available to the Small and Medium Enterprise (SME) sector, the process can be daunting. In my 2012/13 Grant Industry Report, I have set out the numbers of applicants and the value of the funds paid out in the R&D Tax Incentive, Commercialisation Australia and Export Grants (EMDG) programs during the 2012/13 financial year. In researching the information, some interesting information came to light. In the R&D Tax Incentive section, for example, I note that $18,5 Billion worth of R&D expenses were claimed. In addition, the number of applications are steadily rising year on year and are projected to increase once again in 2013/14. In the Commercialisation Australia section, I point out that Queensland had the highest number of successful applicants by both number and value. With Export Grants, I show the analysis that first time EMDG applicants have a higher chance of having their applications rejected than applicants in other years. Talking with applicants, accountants and consultants I am continually amazed at how many people are still unaware of the amount of Government assistance is available to SMEs. The purpose of this report is to try and inform more potential applicants of what is available and that the process can be eased by using consultants to assist in the application. For more information download the report.